Line a 15-in. x 10-in. x 1-in. baking pan with waxed paper. Coat the paper with cooking spray; set aside. In a large bowl, beat eggs for 3 minutes. Gradually add sugar; beat for 2 minutes or until mixture becomes thick and lemon-colored. Beat in pumpkin and extract. Combine the flour, cinnamon, baking powder, ginger and salt; fold into pumpkin mixture. Spread batter evenly into prepared pan. Bake at 375° for 10-15 minutes or until cake springs back when lightly touched (do not over bake). Cool for 5 minutes. Invert onto a kitchen towel dusted with 1 tablespoon confectioners' sugar. Gently peel off waxed paper. Roll up cake in the towel jelly-roll style, starting with a short side. Cool completely on a wire rack. For filling, in a small bowl, beat the cream cheese, butter, vanilla and remaining confectioners' sugar until fluffy. 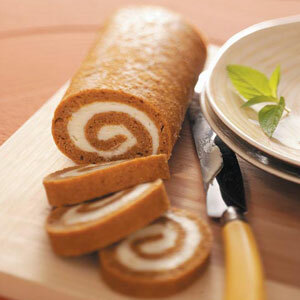 Unroll cake; spread filling evenly over cake to within 1/2 in. of edges. Roll up again. Cover and refrigerate for 1 hour before serving. Yield: 12 servings.